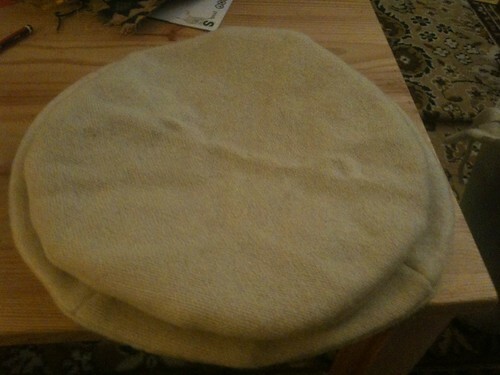 DH hat was the first one made, as the one that definitely had to be done. 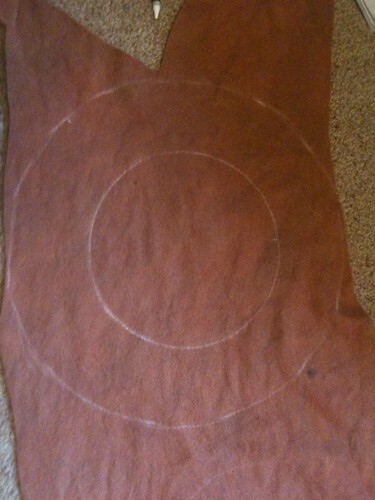 We had dyed an old blanket with a mixture of terracotta/brown [i think] to use for jerkin and hat. 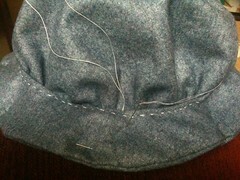 For BB’s I used some much lighter denim blue wool that i had left over from making my wool apron – lighter wool is far far easier to use with the original pattern! 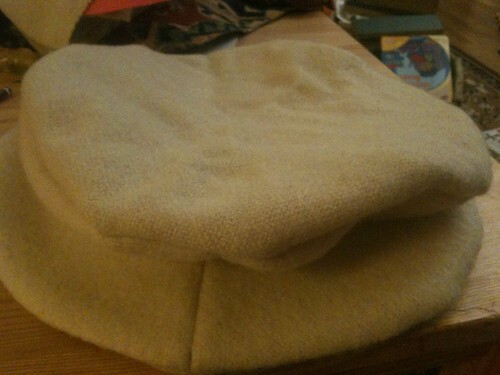 And for mine and sb’s in a different design I used ‘loomstate [ie undyed] blanket of pure wool. 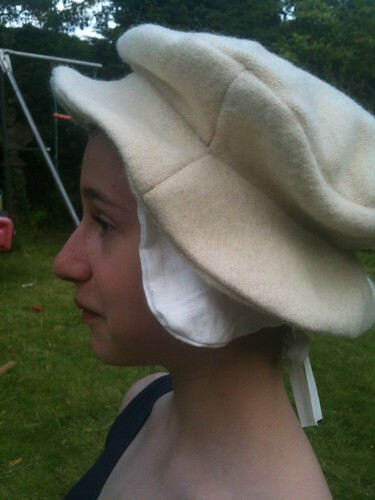 SB had hers dyed a fetching sage green by the dyers at kentwell. 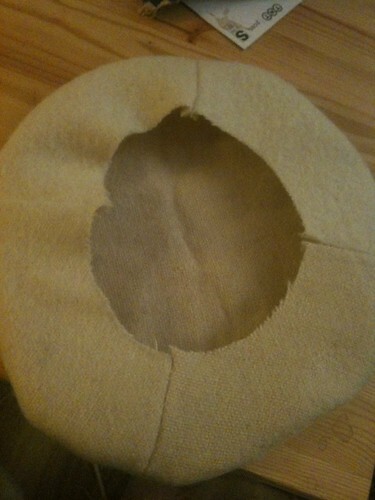 so using the above hat guide, I marked out the crown hole and the edge of the brim with tailors chalk. I cut out two of these in the wool i was using [which i felt sufficiently thick not to do all the layers of the instructions! 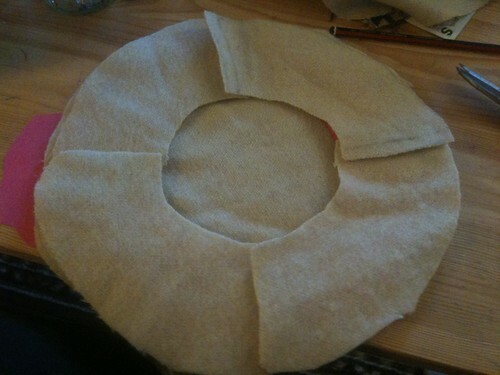 and I cut one out of buckram. 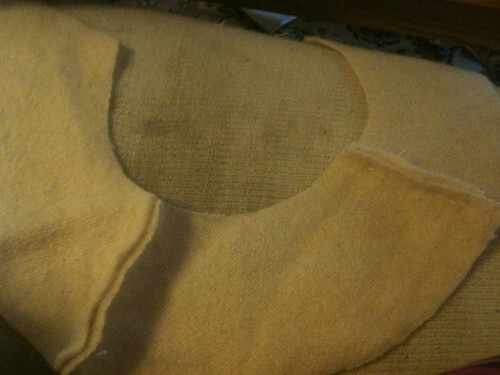 I cut out 2 circles – one in the wool and one in linen lining and then roughly sewed with running stitch all around the outside of these and pulled tighter to pleat so same size as head hole. 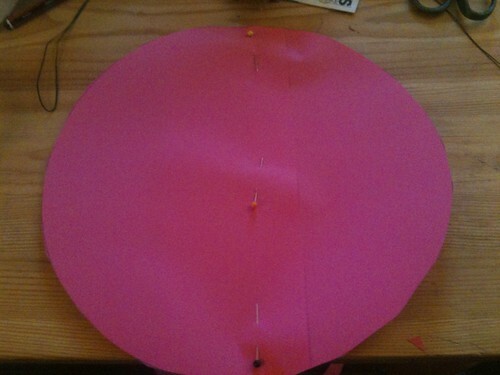 the first time when i roughly placed this in there was far far far to much pleated material, and massive puffiness to the hat, so i reduced the diameter of the circle by 2 inches and resewed. 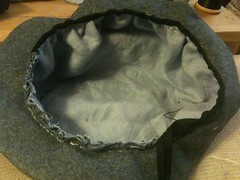 I also went back to the crown and turned over the wool on one side, tacking it to the buckram to hold it down. 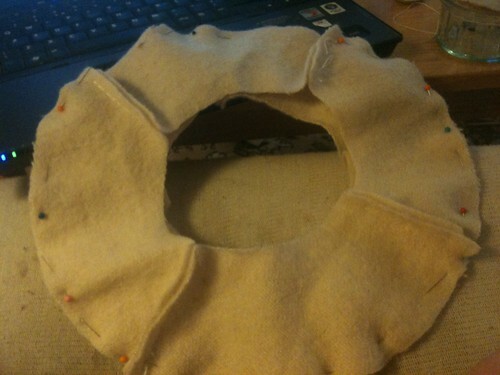 I made linear cuts in the seam allowance on the other side of the wool crown and then pinned the crown to this and made sure i was happy with the result before sewing together. 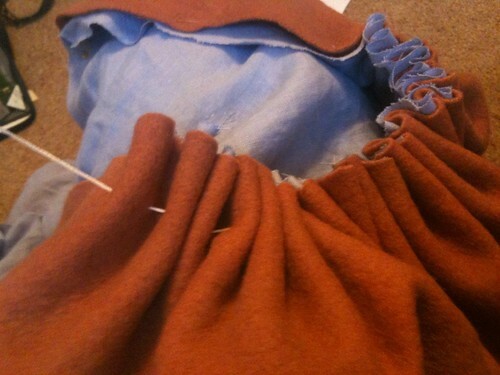 i then trimmed off seam excess and went over with bias binding. 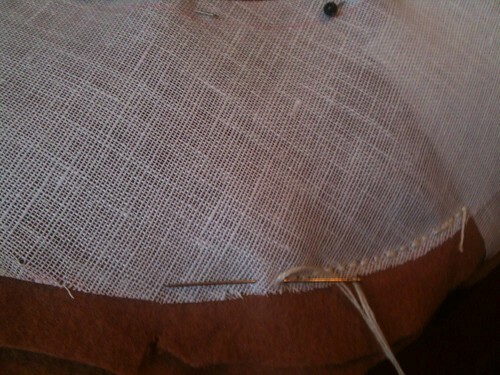 this is thick wool and pleated, so it was tricky! 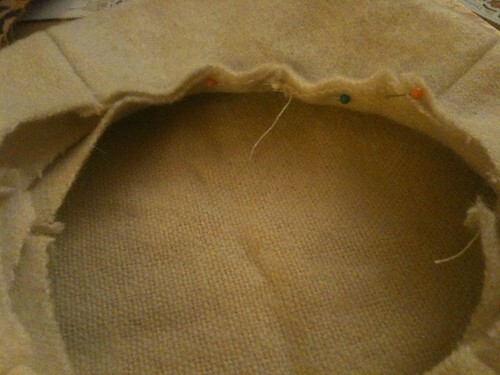 I ladder stitched the brim on the otherside to the crown to make secure. 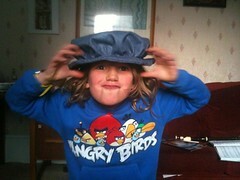 hat still a bit puffball, but did look well. I am debating adding a braid to the hat. 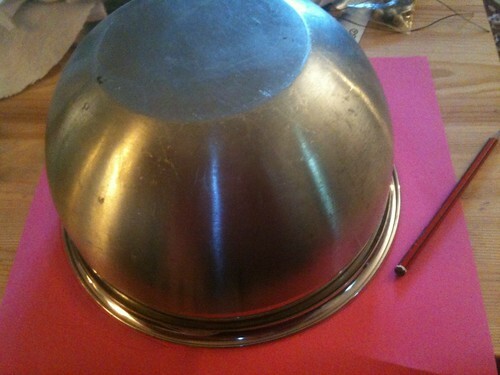 i made a narrower brim and less excess for the crown – learning from above. 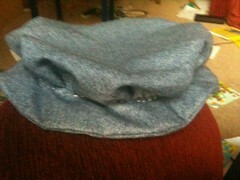 this was much much thinner wool, and consequently a far easier and simpler hat to make. i followed the same steps and had done within the hour. where i tacked on the bucram this time i did a backstitch visible on the outside, planning to cover with braid – as yet not done! 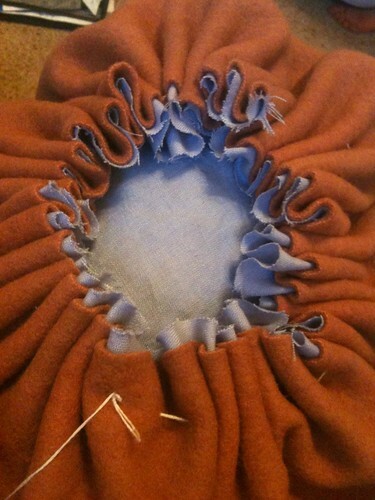 In making this, I was being very sparing and using the end of the blanket that i had made my jacket from to make sb and mine hats. 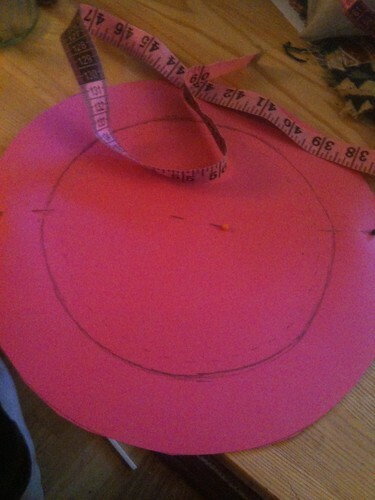 there was therefore not big pieces to be cutting out lots of large rounds, so I cut out the shape of the brim in paper [having measured SB head and got the diameter from that] and then used this to make one circle for the crown for each of us of the same diameter as to the outside edge of the brim. 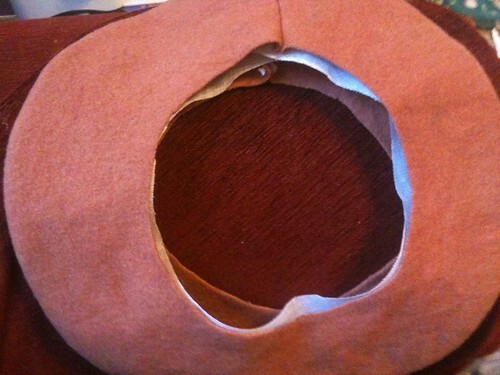 for this hat, instead of making 2 brim pieces, you need 3, so that you sew 2 brim pieces together [with or without buckram stiffening in the middle] and the third brim piece to the crown, and then finally sew the crown brim piece to the brim. 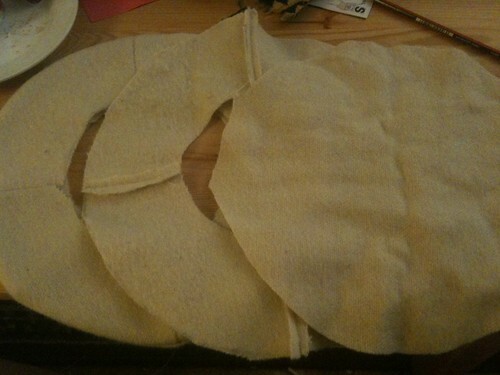 However, I did not have enough material to cut 6 brim pieces [3 each] in a nice big circle, so I divided all the brim pieces into quarters, and cut out 12 each – remembering seam allowance. 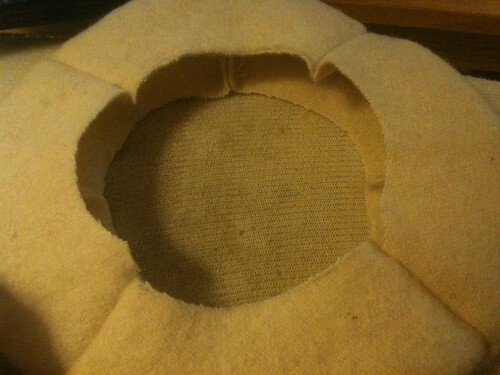 This fitted on my material. 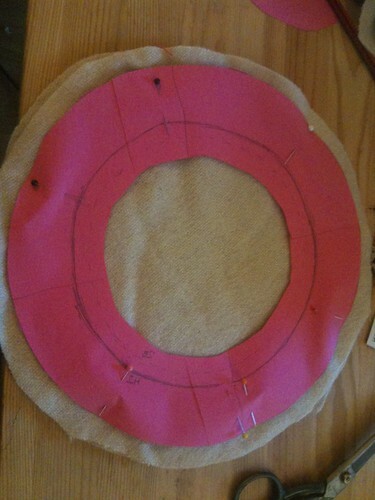 i sewed 4 quarters using back stitch to make a complete circle, and did this for each of the 3 layers. 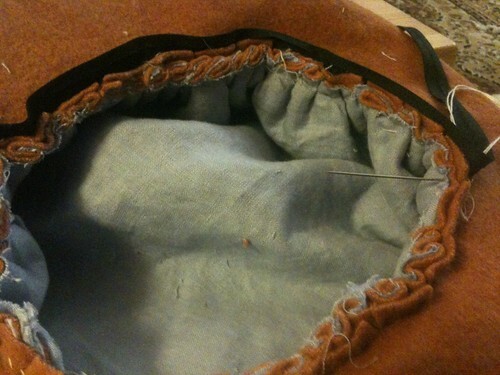 i pinned two brim pieces together, right side to right side and then sewed all around the outside edge at the seam allowance. 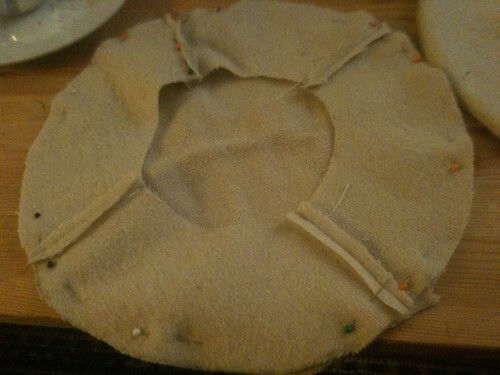 If i was using thinner material, this is where I would have sewn in the buckram ring also [like the hats above] but i felt that this was a soft cap, and the material was thick enough. 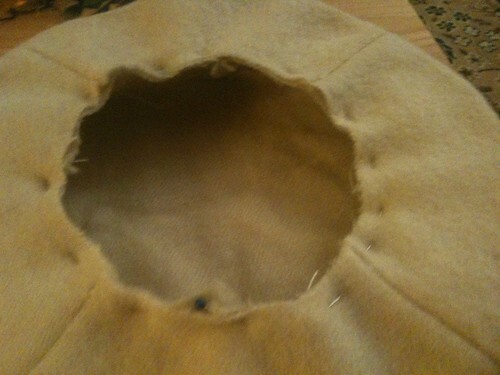 When I had sewn all around, I trimmed the triangles in the brim and then turned right side out and ironed so it lay well. 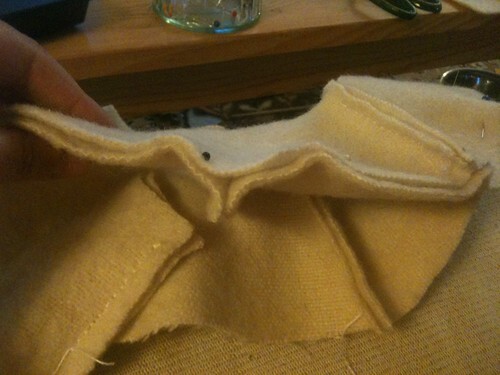 i then took the third piece shaped identically to the brim, and pinned it right side to right side to the crown and sewed around the seam allowance at the outside edge, cut triangles into seam allowance and turned right way around. 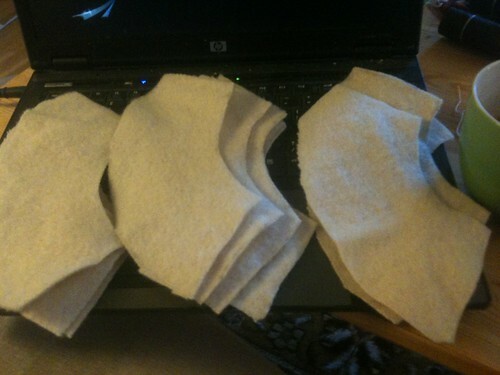 Iron it – i didn’t and wished i had, so did iron the next one! 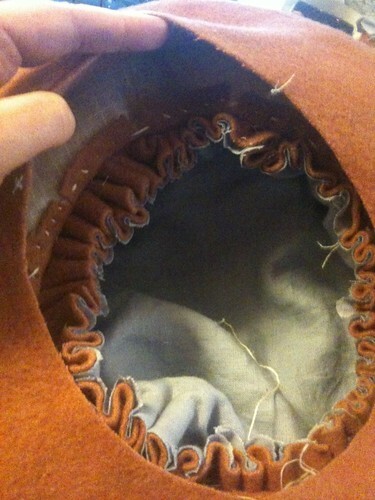 then I turned over the upper brim to hide the edge and ladder stitched all around the outside between that and the crown. 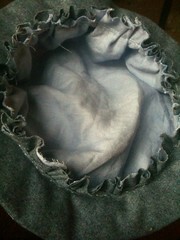 And we are done though would be better ironed! I think the look with quarters was fine, and in fact would be fine to quarter the crown also if needed to fit a final bit of material. Thank you so much for a brilliant blog! 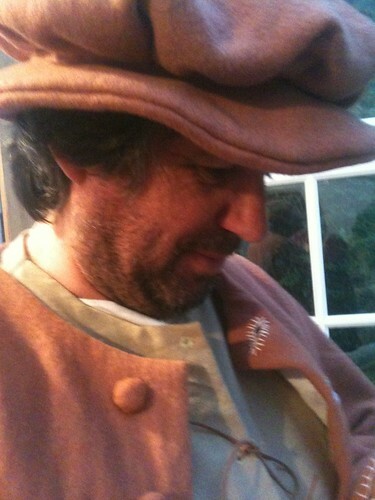 I am a Kentwell newbie this year but had been reading your blog beforehand…. 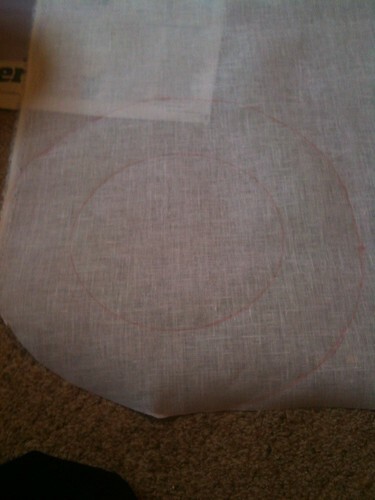 Too nervous to attempt a smock yet so I’m going to make a hat, and follow your last pattern here. 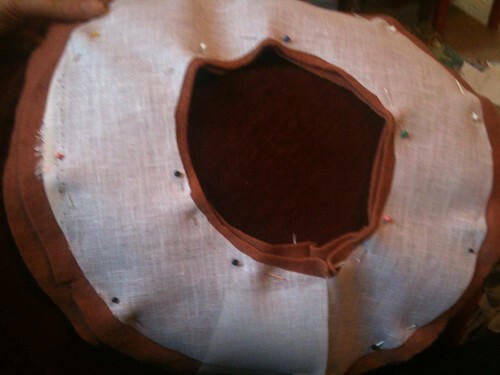 Wish me luck – all I’ve ever done till now is sew on buttons, and bodge up moth holes….